ar.icio.us is a PHP script that allows different sorting methods for your del.icio.us RSS feeds. 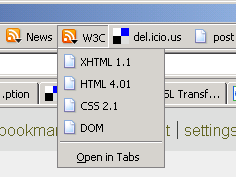 I was pleased to discover del.icio.us as a way to have my bookmarks accessible from anywhere through RSS feeds. Especially with Mozilla Firefox's support for Live Bookmarks. 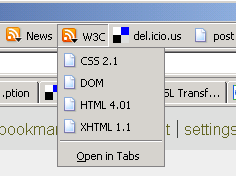 Unfortunately, I got a little bit disappointed when I saw that del.icio.us had only one sorting method for the bookmarks (by date, most recent first). Instead of linking to a del.icio.us feed, you can link to ar.icio.us. The script connects to del.icio.us with your user account, fetch the bookmarks, sort them and send them to you as an RSS feed. ar.icio.us uses a cache directory to store your bookmarks so that they are not fully downloaded from del.icio.us each time you make a request. The cache is automatically refreshed if you add a bookmark to your del.icio.us collection. Please note that ar.icio.us is not a public service, like del.icio.us. You have to run your own copy of ar.icio.us on a web server. To use ar.icio.us, you need to have access to a web server supporting PHP 5. Replace your.server.com with your server name and ar.icio.us.folder with the folder you uploaded the files to. Replace your_tag with the del.icio.us tag you want to list, and your_sort_criteria with the sorting method you wish. The sort parameter is optional. The default value is description. ar.icio.us was written in PHP 5 using SciTE editor. It uses the del.icio.us API to get the bookmarks then an XSLT stylesheet to sort them and convert the data to an RSS feed. The name of this script is a lame phonetic mix of "RSS" and "del.icio.us". ar.icio.us is part of the Wistinga Projects.